Throat infections are very common during the flu season and can get really bad in case there are no precautions taken. You know it is throat infection when there is constant pain in the throat and it gets itchy, dry or scratchy. Soaring of throat can be agitating as it may hinder your efficiency at work and mess with your good mood back home. Throat infection heals with time but you can still help yourself healing by applying some home remedies. Thee various kinds of throat infections are listed below along with their symptoms, causes, preventions and best-suggested ideas for home remedies to treat them. Tonsillitis- Tonsils works as defense mechanism and present at the back of the throat. When these get infected the situation is called tonsillitis. Pharyngitis- Swelling and itching of the area right behind the mouth. Laryngitis- Swelling and discomfort caused in the larynx. Problems like running nose, nasal congestion, cough, chills, headache, body-ache, sneezing and swelling of glands in the neck may also show up in the case of throat infections. Cold and flu- Viruses are the most common causes of sore throats. Viruses like mumps, chickenpox, mononucleosis, measles and common cold and flu can trigger throat infections. Strep Throat- Group A Streptococcus bacteria is also responsible for causing infections in the throat which is commonly known as strep throat. The swelling of tonsils or tonsillitis may also be due to bacterial infections. Dry air- One of the causes of soaring in the throat may be dry air in the winter months, sucking moisture from the throat to leave them dry and itching. Allergies- People prone to allergies have an increased risk of contracting a throat infection due to triggers like dust, grass, pollen etc. Go for Gargles- This is one of the most suggested remedies for sore throat and mind you, this old trick works wonders. Add a pinch of salt to a glass of lukewarm water and gargle twice a day. It will reduce the soreness of the throat and also the itchiness and irritation. The reason behind this remedy being so effective is the increased blood flow in the pharyngeal region during the process which helps by washing off infections and helps in reducing the edema associated with it. This often loosens up the mucus and helps it to get out of the body smoothly. Take medicines- There are other natural ways to reduce infections which must be included in the daily routine besides taking medicines. Taking anti-inflammatory medicine such as Meftal Spas works instantly and reduces the pain and swelling in the throat. Since aspirin and ibuprofen is not recommended for children, they may take paracetamol to get rid of throat infections. An antibiotic like Azee 500 has medicinal properties that reduce pharyngitis by treating infections caused by bacteria. Consult your doctor before using the medicine. Apart from anti-inflammatory medicines and antibiotics, lozenges, especially the ones with cooling ingredients also provide a relief from the irritation in the throat by keeping the throat moist with the increase in production of saliva. Drink warm fluids- Your throat tends to go dry in case there is an infection and therefore, you need to keep yourself hydrated and your throat moisturized to get rid of irritation in the throat. Drinking warm fluids like lukewarm water, tea. Have chicken soup if you like. Warm fluids help to reduce soreness in the throat and keep the throat from drying. Eat soft food- Avoid eating dried food like chips, bread, popcorn or crackers or anything crusty. Also strong drinks and beverages like coffee, soda, alcohol etc. will worsen the condition. Eat well cooked, warm meal like pasta, cooked cereals or oatmeal, cooked veggies, hard boiled or scrambled eggs. And why stay away from desserts? Plain gelatin desserts or ice-pops can help healing. Drinking non-acidic juices is fine as well. Local heat- The discomfort and pain during throat infections increase whenever we swallow something and therefore, even having our daily meal is an ordeal during those days. In order to give your throat some relief, you may get yourself a heating pad or a hot towel and wrap it around your neck. The aching in the throat reduces with applying some local heat. Marshmallows- This is no proven trick but there is no harm trying it. Do not think of marshmallows as little treats to please your sweet tooth for all you would need is the sap of marshmallow plants. The sap is used as a remedy for cough and cold and is equally effective in the treatment of sore throat too. Try out humidifiers- It is painful when you have a sore throat because the air around you is dry. Humidifiers fill the air with moisture and thus, it helps with the throat pain. Take some rest- Rest your voice and avoid speaking loudly until the condition improves. Sound sleep is a remedy for most of the health problems. Take rest and give your body the time to heal. Stream- Sore throat is often accompanied with a blocked nasal. The remedy here that works the best is adding a cough suppressant in your stream and inhaling it for speedy recovery. It shall help with the blocked nasal as well as work for the sore throat. Analgesics antipyretics- Use medicine as prescribed by the doctor. Do not use any medicine without a prescription. Increased infections may lead to fever, severe head and body aches. Antipyretics may be taken in that case to bring down fever and to lower body temperature. The common antipyretics are ibuprofen and aspirin. While you try out these DIY remedies and see what works for you the best, here is a list of things that you must avoid as you are on your way to healing yourself. Do not smoke and avoid caffeinated drinks. Avoid eating food which is oily or fried. Eat boiled and well-cooked food instead. Do not exercise as well because you do not want to exert your body as you heal. Take rest. Avoid going out to public places if the weather is really dry. Inhaling in the dry air will dry out your throat even more which shall have an anti-action. Sore throat is definitely an agitating experience and one needs to deal with it with patience. Include these hacks in your daily routine whenever you contact a throat infection. Take required dosage Azee 500 after consulting your physician with lukewarm water or fruit juice. Keep your doctor updated about your condition. As the seasons take turn, cold, flu and infections are sure to come in flocks. We need to follow a wise saying in this case- Prevention is better than cure. It is best to take precautions and be safe this season. 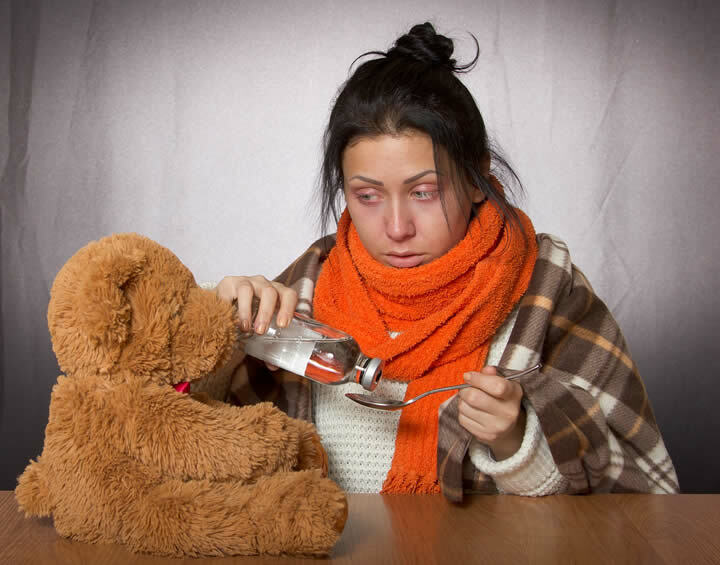 Talk to your doctor as soon as you see any persistent symptoms of cold or flu and follow the medications prescribed. Even in case you are injured, take an aid as soon as possible, talk to your doctor and make sure you take measures to ensure the area does not get infected. Visit your doctor if the condition lasts more than 5 days. You may also ask your doctor to suggest you an alternative medication in that case. Lastly, try out these simple home remedies to heal yourself faster.